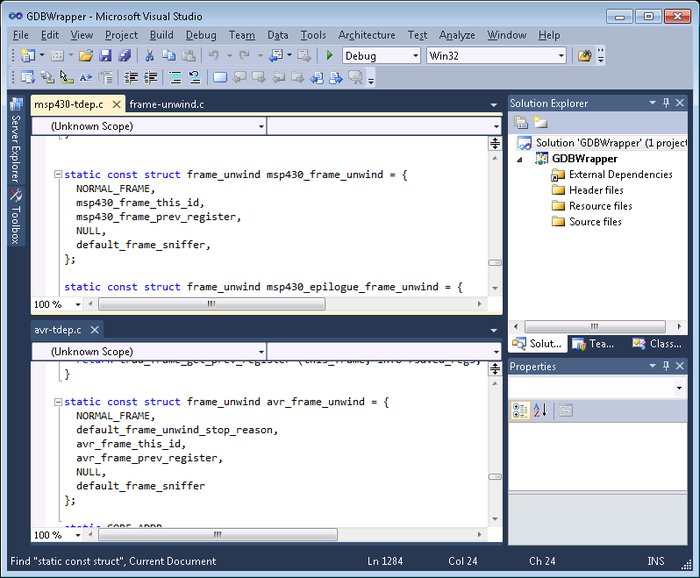 This tutorial demonstrates how to debug GNU applications built with GCC using Visual Studio. 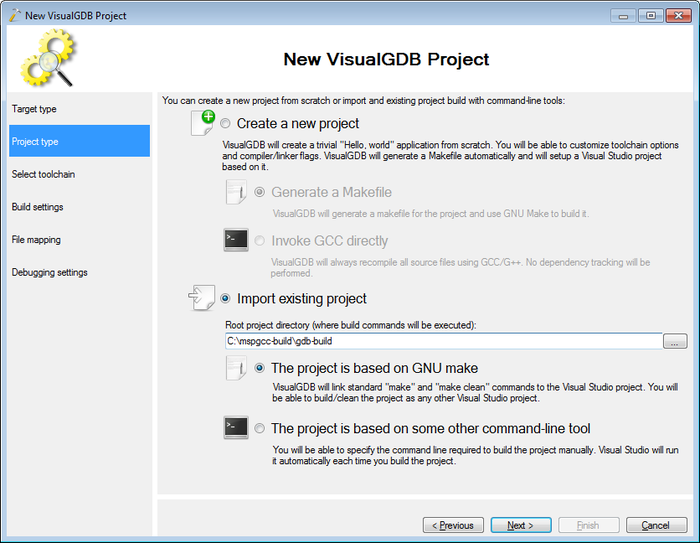 We will show several debugging techniques by applying a patch created for gdb 7.2a to gdb 7.4 (and thus obtaining a crashing executable due to no backward compatibility), debugging the crash with VisualGDB, locating the problem and resolving it. 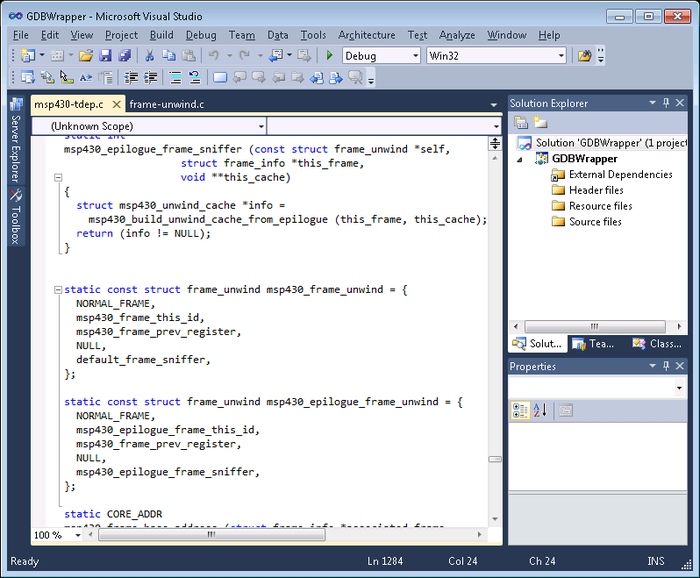 Although the specific case demonstrated in this example (applying an old patch to GDB) is rare, the tutorial shows various powerful debugging techniques made possible using GDB with Visual Studio. 1. 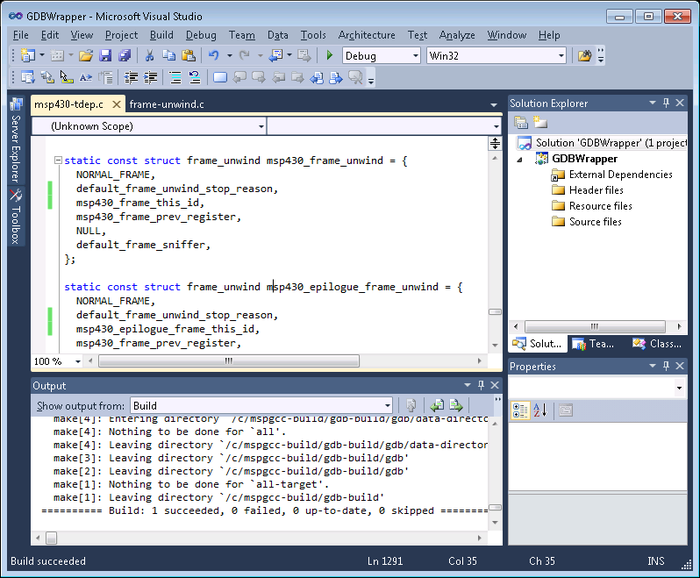 Download and install MinGW, and VIsualGDB. 2. 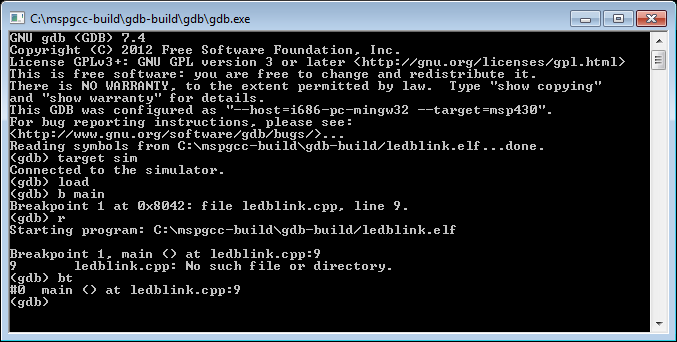 Download gdb 7.4 to c:\mspgcc-build and start the MinGW shell. 4. 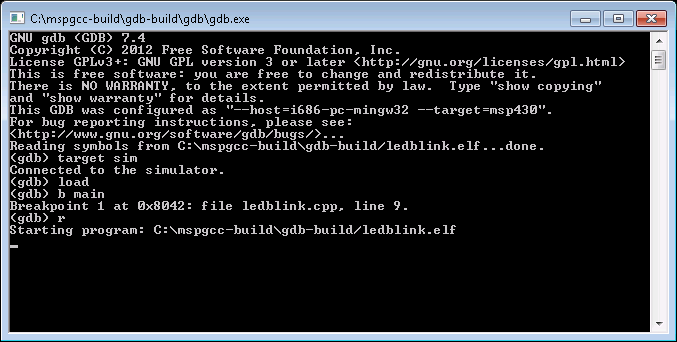 Download the MSP430 patch for gdb 7.2a to c:\mspgcc-build. 5. Apply the patch. The patch adds support to the MSP430 processor family. 8. 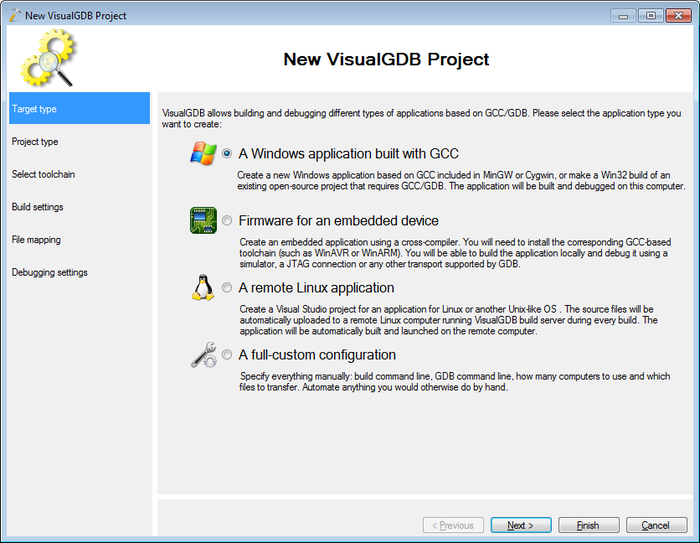 Reproduce the GDB crash. 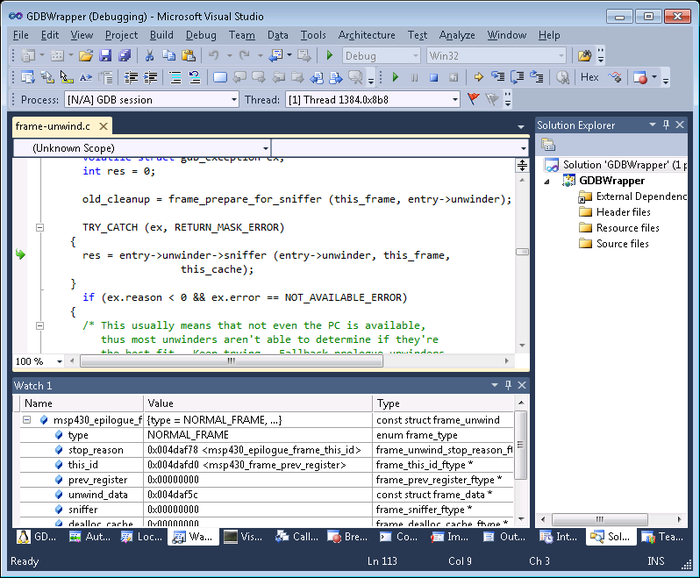 Load a simple ELF file into the simulator, set a breakpoint and run it. You can download a sample MSP430 ELF file here. 10. 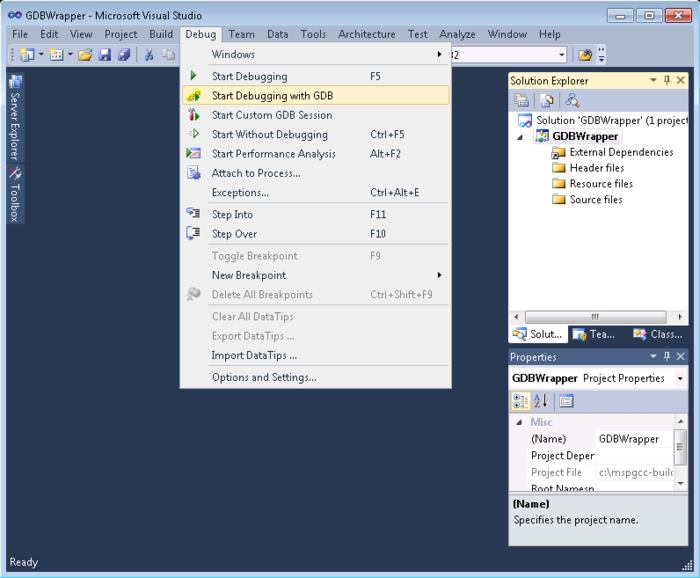 In the project type selection screen, please select “A Windows application”. 11. 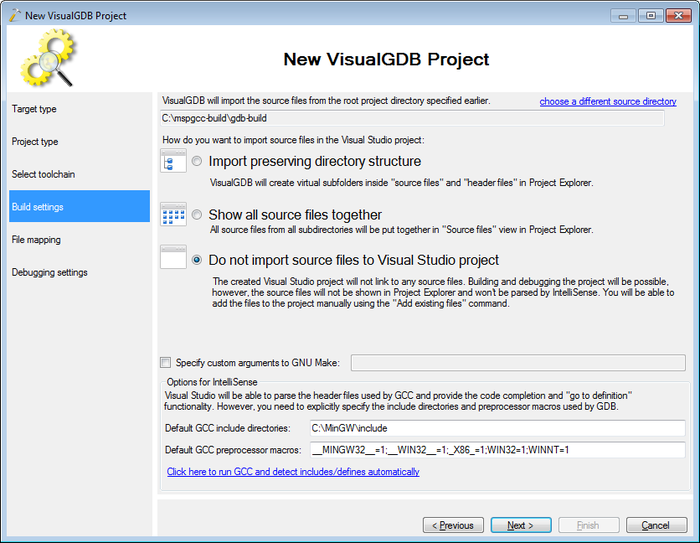 On the next screen select “Import existing project” and specify the location of the gdb-build folder. The folder you specify should contain the Makefile. 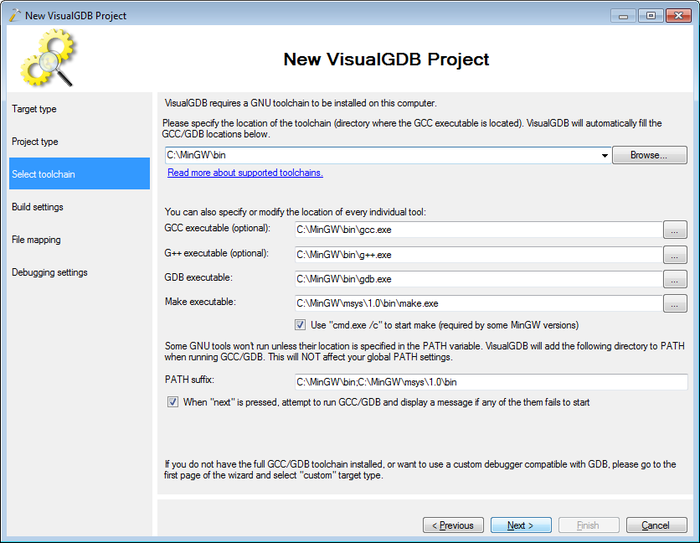 Do not specify the folder with GDB sources. 12. Ensure that the “GNU make” option was automatically activated. If not, you have specified a wrong directory (containing no Makefile). 13. 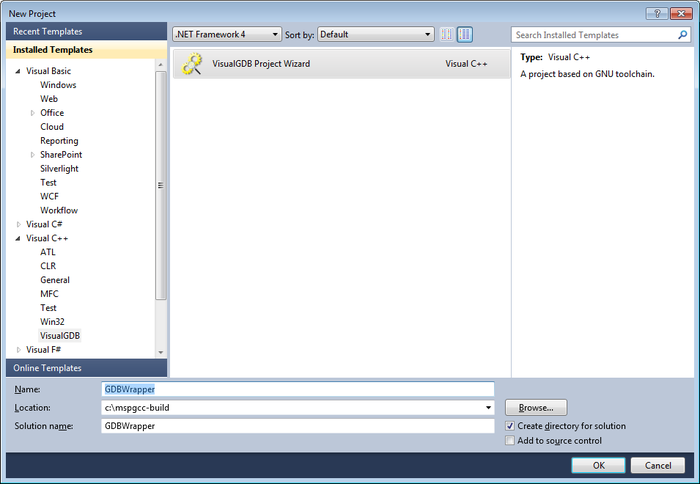 The next screen allows selecting the toolchain. Normally, you should leave the default settings. 17. When the wizard is done, an empty project will be created. 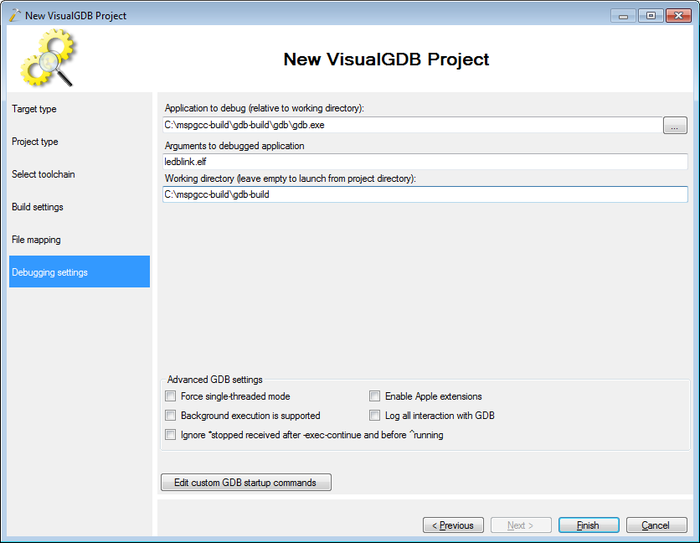 Start debugging by selecting Debug->Start debugging with GDB. 18. 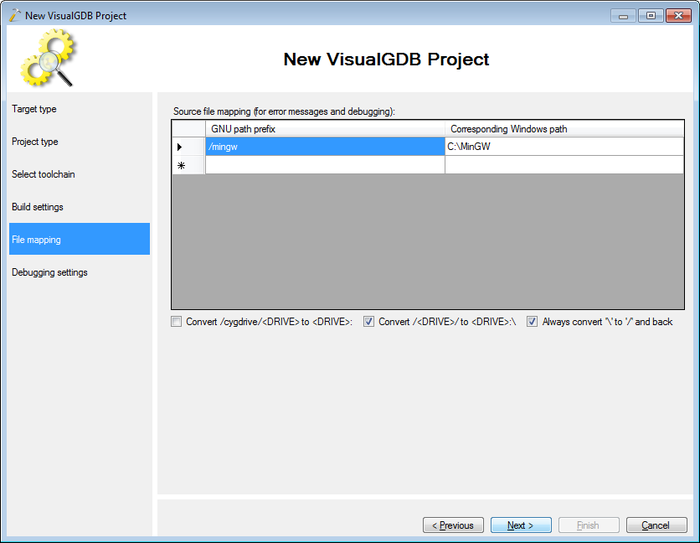 VisualGDB will use the GDB from MinGW to debug our freshly built GDB for MSP430 platform. 22. By hovering the mouse over sniffer we can see that its value is zero. To see where does it come from, hover the mouse over unwinder. Let’s retrieve more information about the address of unwinder from GDB. Double-click at the value popup, select the address and press Ctrl+C to copy it to clipboard. 23. 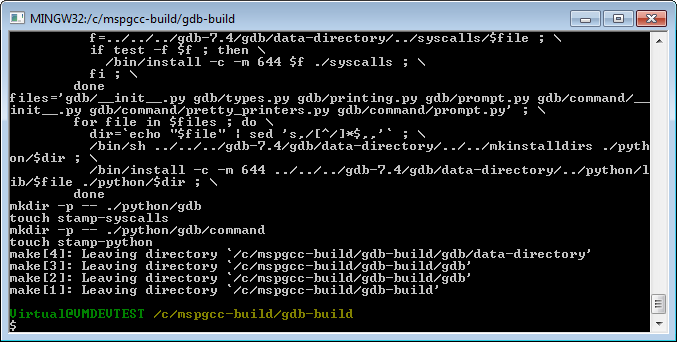 Open the GDB Console window type “info symbol <space>” and press Ctrl+V to paste the address. Press Enter to execute the command. 24. The address actually corresponds to msp430_epilogue_frame_unwind symbol. Copy it and paste into the watch window by selecting it and pressing Ctrl+V. 25. Looks like the field values after NORMAL_FRAME do not correspond to the field names. E.g. 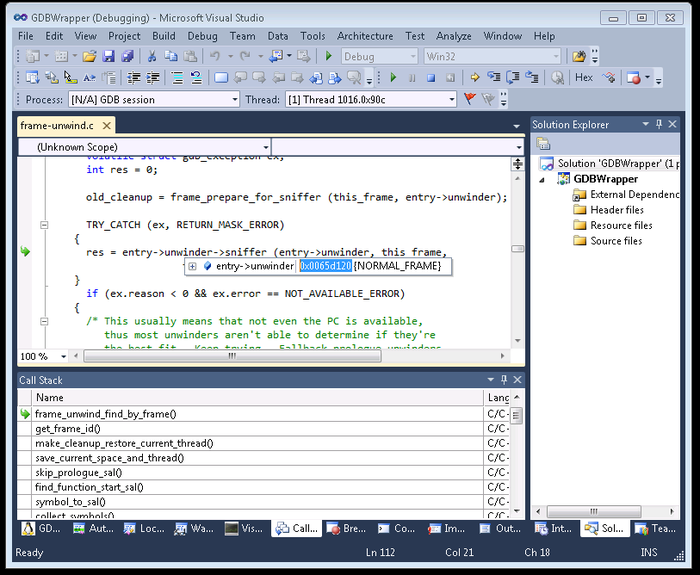 the msp430_epilogue_sframe_this_id is assigned to stop_reason instead of this_id, and so on. 26. Search the source files in the GCC directory for msp430_epilogue_frame_unwind. Open the msp430-tdep.c file containing the definition. 28. Looks like the stop_reason member was added and thus has to be initialized. Copy the member initialization from the AVR code to both structures. When done, build the project by pressing Ctrl+Shift+B. 29. 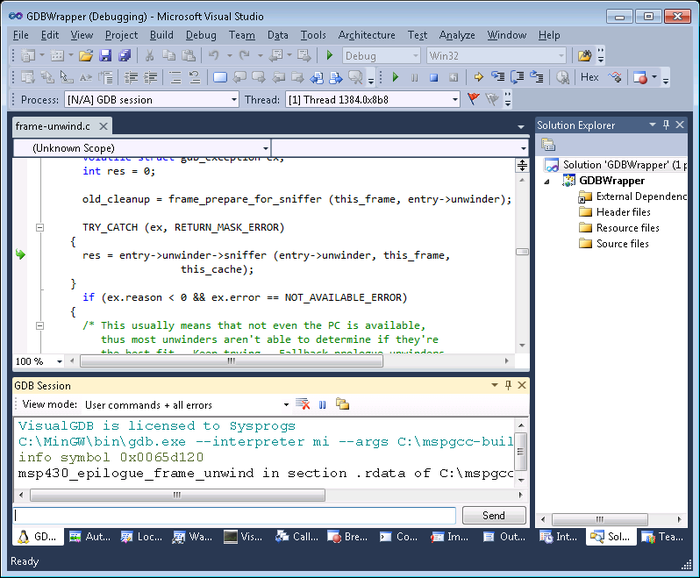 If you made any errors, GCC will report them and Visual Studio will display them in the error list. 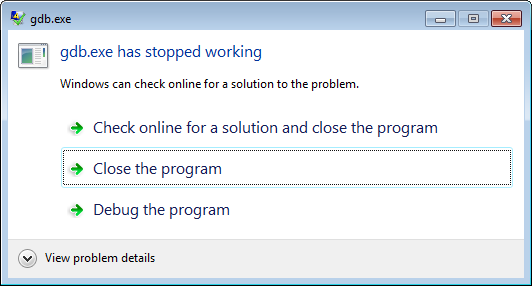 You can then press F8 to automatically jump to the first error and so on. 31. 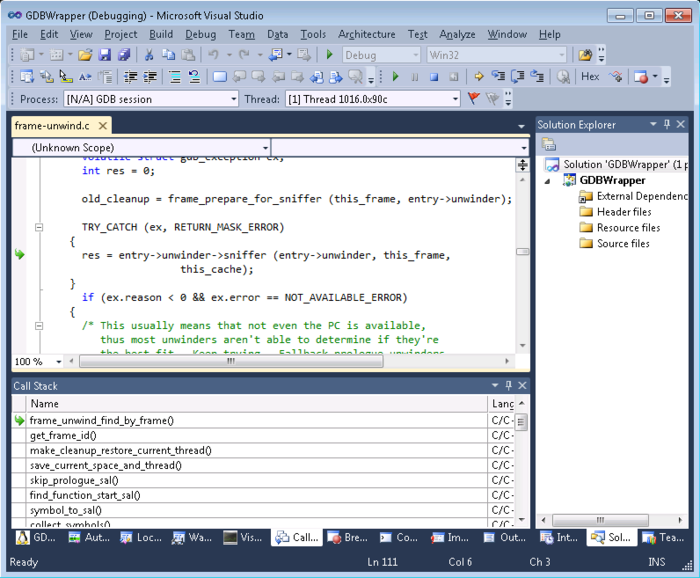 As you can see, updating the frame_unwind initialization solved the problem.